If you absolutely hate princesses and happily ever after, I suppose you could skip this children’s book. 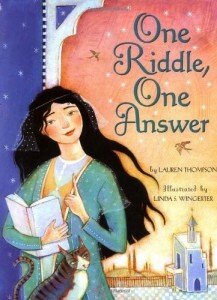 But if you can forgive that, and focus on the idea of math and riddles, this is a sweet little story, to help inspire young girls to love math. As a female mathematician myself, I love the idea that at an early age, young girls could be inspired to love math. And loving math doesn’t preclude happy relationships either. I think a children’s book like this is meant to take us out of arguing about what is politically correct and just enjoy the little math problem. I have long demurred on including illustrated books on this website, simply because the number of them is infinite. However, I am encouraged to include an illustrated book when it leans towards non-fiction, such as this one, or biographies, such as the recent biography of Fibonacci that I reviewed. The illustrations are suitably inspiring. In any case, this is a simple and enjoyable way to present numbers and riddles to young children who are already showing signs up interest in numbers. Good for six to eight.